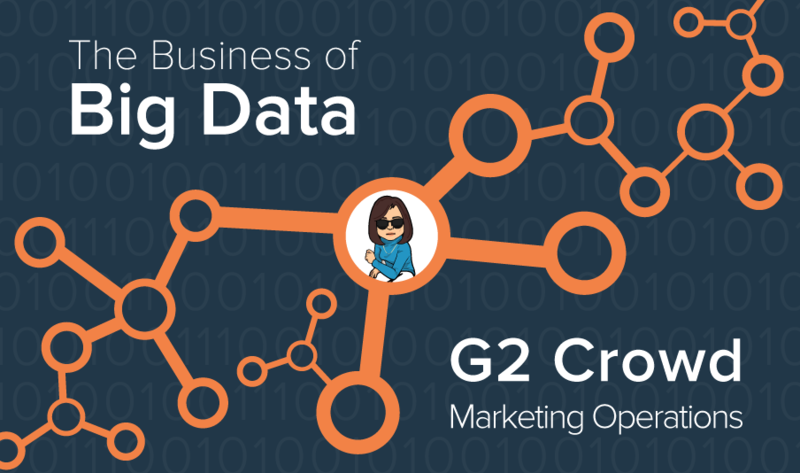 Throughout the month of March, G2 Crowd’s research department will share our insights around the topic of big data software. Check back here, on the blog and on our social channels to read the latest. In the marketing section of the fictional case study, Sandy Washington, the VP of Big Toy, used marketing automation tool Marketo to leverage existing customer demographic and behavioral data to effectively target prospective customers and streamline the sales process. The G2 Crowd research team spoke with our own marketing operations manager, Mary Anderson, to understand her day-to-day and overall scope of responsibilities within the marketing department. Research Team (RT): What is your background in marketing? Mary Anderson (MA): My background is in email marketing, internal communications and design. I first joined G2 Crowd as a digital marketing associate and more recently became the marketing operations manager. When our team adopted a marketing automation software tool, we decided it needed an owner. That’s when I took on the operations role; we now have a go-to contact for marketing automation and the data that comes along with it. MA: It varies, but I leverage the functionality of our marketing automation tool every day. I manage our lead scoring system, meaning I take demographic data from our contacts and behavioral data—the way users interact with our website — and translate it into a score. That combined score identifies “hot leads” for our business development representatives and account executives, and informs the outreach they conduct on a day-to-day basis. In addition, I manage the deployment of our report notifications. On a weekly basis, I help identify the main points of contact for each product and make sure they’re informed about upcoming reports in their product space. I also manage the build and send of our quarterly newsletters, sharing best practices and recent content marketing efforts. We recently compiled an ebook detailing how business professionals can leverage reviews in their marketing strategies. Less frequently, I build landing pages and other campaigns (in our CRM software and marketing automation tools) to track behaviors, and a lot of that rolls up into the lead scoring or success tracking, like return on investment and our influence. RT: How do you use big data day to day? MA: We’ve never been short on data. It’s always been, “We have that but can we get to it?” A lot of the troubleshooting we do, and have been doing, is “How do we get this data accurately?” I work a lot with Cameron [Bumstead] and Kenny [Browne]. Kenny is the owner of the data in our site’s admin, Cameron is the owner of our Salesforce [CRM] data, and I’m the owner of Marketo and that data. Ideally, [the data within the three systems] are all the same, but we have to discuss how the data is mapped out so we can access it properly. [G2 Crowd]’s instance is super unique and interesting because we have two different audiences: we have users and software/service providers. Even with providers, though, people can own multiple products. It’s basically a huge web and Kenny, Cam and I try to map the web so everyone’s connected properly. With so many people, it’s difficult. Right now, our main issue is “How do we communicate to our database? How do we use the tools we have, to use the [stored] information?” The information is all in there, living, but the big struggle with having that much data is identifying when the tool is not working. And it’s hard because a lot of the time we discover issues by accident. Most of the time, I’m double checking the list, and it’s, like, “Hey, why did this person go there?” Or, “Why is a customer not there?” It involves identifying how our filtering mechanism looks at the data and why it didn’t filter correctly. The big struggle is really how we call the data, because it’s so complex. RT: Most of the time, do you discover new efficiencies and that informs your next move? MA: Yes, most of the time. We’ve had a struggle, because our Salesforce instance is so unique. We can’t have a package deal, because we’re not like everybody else. It’s been hard to communicate that we truly are unique, it’s not just that we just think we’re special. It’s taken a while to have people understand that. We’re in unchartered territory. For most people, the customer database is a one-to-one relationship. One person [equals] one company or one product. In our database, we have a lot of one-to-many relationships. One person [equals] three products. You can imagine it’s hard to call to that. I want information but how do I get to it? It’s not as direct as you think. It requires a lot of learning on the fly, and it’s figuring out: if this is what I want to do, this is the filter I want, and if I try that, does it give me the data I want? If not, why doesn’t it? It’s asking a lot of questions and narrowing down on what the problem is and working with the right people on the right teams to solve it. Almost every time, it’s a group effort in finding the solution. Which is really awesome that we have a group to do that, it’s not reliant on one person to solve. It has become easier over time because I’m learning how to troubleshoot within my own tool because common things keep coming up. And with that troubleshooting knowledge, I can have a more informed discussion with the greater team. MA: It depends on where the discovery point of the issue is. The customer success managers might discover the issue, because they have close customer relationships. They might discover a contact missing on an email and they come to me and I try to figure out what happened. It’s nice; we have a data activity trail which informs our customer service. There’s no true start [to a workflow]: It’s almost like someone identifies the issue and then they bring it to either Kenny, Cameron or I and usually we three work together to solve it. Any time it’s data, it touches one of our systems. We’re still trying to identify the source of truth and where the break in communication is. Once we identify what system is causing the issue, then we focus in on that system and how to fix it. RT: Have you discovered anything unexpected as you manipulate, access or retrieve data? MA: Let’s see. There’s an interesting thing happening when we use data in email. Email is getting hyper-personalized and everyone wants to have a personalized experience in marketing. We use data to do that and we need to call to the data in a specific way. It’s really key to get it right, because it’s either super personalized and straight on, or it’s not and they’re going to delete it. We’ve been trying new ways to manipulate the data and a lot of the time it calls for writing in a scripting language, so I’m learning to write in this velocity script that’s not common among our developers. Basically, there’s data in a list, and I want the script to look through the data and only return the things that are relevant to that specific contact and nothing more. Data helps us personalize the journey for each of our contacts, which tends to get us more interactions because it’s not a bucketed statement. There’s a lot of ways we can manipulate the data to make emails more personalized and feel more seamless for the end user. In the back end, there’s a lot of work that goes into manipulating it to make it look seamless. RT: For you specifically, how does data factor into decision making or forecasting? Are you cross-departmental? MA: G2 Crowd data got bigger when we got a marketing automation tool because it made web activity easily available. Both the marketing and dev teams use the web activity functionality, and we’ve identified how to monetize that data access. Google Analytics can tell you how many people [have visited a site], but it can’t tell you [information about] the exact person. Marketing automation tools can. We became big data when we began harnessing web activity and tracking in meaningful and revenue-driving ways. MA: I think people don’t fully understand the work that goes into double checking and leveraging the right data. The hard part is: “Do you ever trust the machine? And should you?” In our case, that’s a really delicate balance, because as soon as you put all your trust in it, there is potential for something to go wrong. There are endless ways to leverage our data that we want to execute but we don’t always have the time or resources to do it. It’s not just a push of a button, as much as I want it to be. As easy of an interface as our marketing automation tool has, there are a lot of nuances and weird things that you have to learn over time, like with any system. The tool is only as powerful as its data and your ability to access it.